What Types of Doctors Treat Prostate Cancer? What Types of Doctors Are Involved in Prostate Cancer Care? 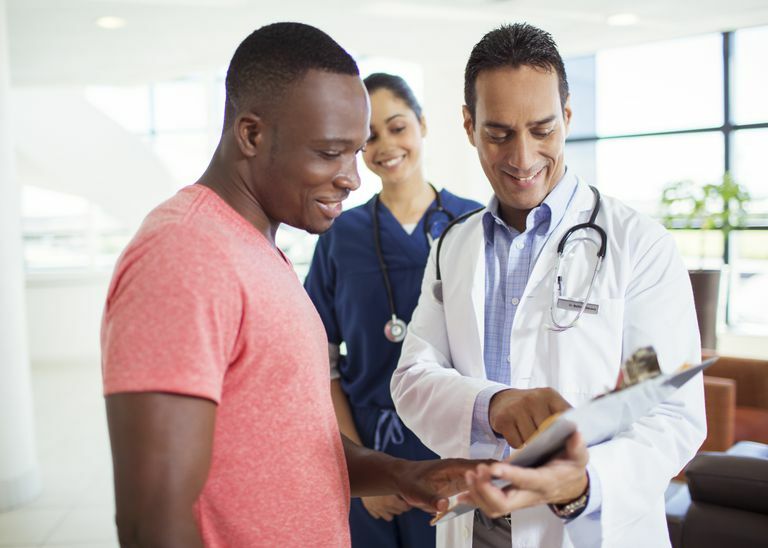 During the course of your prostate cancer diagnosis, treatment, and follow-up care, you will likely be working with a number of different types of physicians. Getting a basic idea of what each of these physicians does and what type of training they have undergone can help you better understand how their efforts work in concert to help you address your disease. The first physician most men see for the majority of their medical problems or routine screening is their general practitioner. There are two types of general practitioners: internists and family doctors. Both are qualified to perform the digital rectal examination and make the first interpretation of your PSA test, as well as oversee your other general medical issues. Internists are trained to treat adult patients only. They do not see children or deliver babies. They have to undergo three years of training in internal medicine after medical school, much of which is spent working with patients in the hospital. They typically split their time between seeing patients in their office and seeing patients in the hospital. This type of physician is trained to treat patients from infants to adults and may also do some obstetrics. Family doctors complete three years of training in family medicine after medical school before they practice independently. They typically do less work in hospitals and more work in clinic or office settings than internists. After a screening, a general practitioner may refer you to one of the following specialists, who each play different roles in prostate cancer diagnosis and treatment. Urologists are physicians who are trained specifically to deal with conditions of the male reproductive organs and of both the male and female urinary tracts. They are considered to be sub-specialized surgeons who must also have knowledge of internal medicine, gynecology, and other fields in order to treat the variety of urological conditions they see. Urologists are required to complete a five-year training period following medical school—one year in general surgery and the remainder in urologic surgery. A visit with the urologist is probably the most common next step after having an irregularity detected by your general practitioner. In most areas, urologists are available and are the most likely surgeons to perform prostate surgery, but in some more rural areas, there may be no urologists available. Radiation oncologists are physicians trained to treat cancer and other conditions with radiation. They are involved in the evaluation of cancer patients and plan exactly how radiation treatments will be administered. They must undergo a five-year training period after medical school, which includes one year of general medicine and four years of radiation oncology. If you are considering radiation therapy as an option for treating your prostate cancer, then you should plan to visit a radiation oncologist for their input about your specific set of circumstances. Radiologists are physicians who use medical imaging technologies such as X-rays, computed tomography (CT) scans, and magnetic resonance imaging (MRI) scans to diagnose medical conditions. Additionally, some radiologists (called interventional radiologists) are trained to use imaging technologies to treat certain conditions. Radiologists must complete five years of training after medical school, including one year of general medicine and four years of radiology. You will likely only have direct contact with a radiologist if you undergo certain specific imaging tests to diagnose or stage your cancer, or if an interventional radiologist is involved in your care (by, for example, performing a lymph node biopsy). Pathologists are physicians who are trained to diagnose diseases by examining body tissues and fluids. When you undergo a biopsy or any tissue is removed from your body—such as in the lymph nodes or prostate itself—a pathologist is the doctor who will examine it, both with the naked eye and under a microscope, for evidence of cancer or another disease. Pathologists must complete four to five years of training following medical school. Medical oncologists are trained in the proper use of chemotherapy and other therapies to treat cancer. Because prostate cancer is not usually treated with chemotherapy, you are unlikely to see this type of physician, though it is possible. Medical oncologists have completed three years of internal medicine training as well as three to four more years of sub-specialty training in medical oncology. While some of the doctors involved in your prostate cancer journey may work together directly, others may not. Nevertheless, for the best care, it's important that information on your case is shared amongst them. Shared medical records help this, of course, but you may also be assigned a case manager whose job (among other things) is to coordinate communication amongst practitioners. You may also encounter nurses and a variety of other healthcare professionals as you are treated. How Likely Is Your Prostate Cancer to Return?